In October, Sonoma County sheriff’s deputies shot and killed 13-year-old Andy Lopez, who was carrying a replica AK-47 in a Santa Rosa field. The deputies fired several rounds from their handguns, striking the boy multiple times. On Friday, Senators Kevin de Leon and Noreen Evans and Assembly members Wesley Chesbro, Marc Levine and Mariko Yamada announced plans for a bill targeting replica guns. The group of legislators made the announcement outside the Santa Rosa courthouse. The proposed legislation would require BB, pellet, airsoft and other replica guns to be brightly colored so they are not mistaken for real guns. California lawmakers return to Sacramento for the next legislative session in January. Once again, the geniuses in Sacramento are not able to think beyond their ignorance. Pink gun = safe. Black gun = evil. If I’m a criminal, I would certainly take my real gun and paint it pink, so when I pointed it at a cop they would hesitate and give me my opportunity to shoot them. This will pass, it won’t work, so the only recourse available to the politicians will be to completely ban and confiscate all guns – for the safety of the police and children, of course. 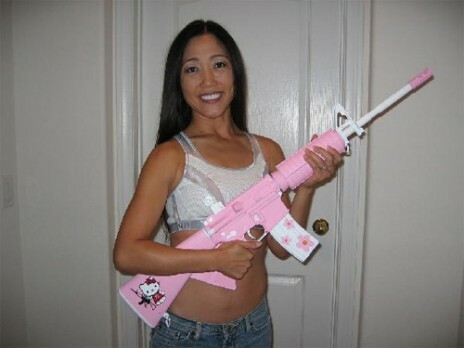 Go all out and get the Hello Kitty AR-15 – that should throw them for a loop. Did anyone else notice that the article contains some internally contradictory phrasing? It goes from “a ban on certain replica guns” to “a bill targeting replica guns” to “The proposed legislation would require BB, pellet, airsoft and other replica guns to be brightly colored so they are not mistaken for real guns.” I am assuming that the last statement is actually accurate and that the first one is inflammatory rhetoric. If I am wrong on this, and the first statement is correct in addition to the last, I may have to revise my agreement with the legislation. When toy guns are banned only toy people will have real guns. Oh, great goshulmighty. That’s the current state of affairs. When I was a kid we made our own toy guns and if the nanny state decides that toy guns should be illegal…. today’s kids will make their own as well. I assume that these are the types of replica guns that this bill is targeting. They look exactly like real guns. We always teach our kids that real guns are not toys, so why should we blur the line by allowing toys that look exactly like real guns? For the first time, I think I may agree with the legislative majority in Sac about a gun law. If all they do is require that guns firing “non-fatal rounds” (BBs/pellets, paint balls) be made in a distinctive color (pink?, yellow?) along with toy guns incapable of firing anything more than a nerf-dart or water, I think that would be a good idea. I don’t think cops should be put in a position to have to make an instant analysis as to the danger level from non-lethal weapons that look like lethal ones. If I want to use a pellet gun that is nearly identical in feel to my real one so that I can save the cost of ammo, I don’t think that having one easily identifiable by color as non-lethal would make a difference If it saves the life of some ignorant or foolish kid, it is a sacrifice I am willing to make and I don’t think that it affects my 2nd Amendment rights in any way. Replica Politicians definately should be outlawed when a new law is not needed, just vote them out. As for replica toy guns, the use of one in a crime affords a real visit to a real jail with real bad people and a possible real bad physical. Do we really need to pay these Replica Politicians for another stupid law? 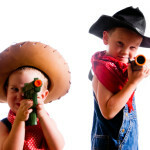 Not only do they want our real guns and ammunition, money (taxes), freedom and privacy…Now they want our toys! It sure is a good thing a lot of us survived playing cops and robbers, cowboys and Indians (and didn’t have to use a pink or orange gun) never wore a bike helmet and only wore a seatbelt half of our life. I’m buying toy guns for the toy drive this year! and may Santa put coal in the stockings of those responsible if they are not delivered! oh yeah Happy Thanksgiving and Merry Christmas! There is a pretty big differece between “toy gun” and the type of guns causing issues for police. I have held and used some of the replica air soft and similar type guns. They are remarkable in their similarly to real guns….I would be fooled if someone jumped out of the bushes with one to my head. The article makes like they are going to ban kids Nerf guns, which is not the case here. If someone “jumped out of the bushes” at a law enforcement officer these days (with or without an airsoft gun designed to look like a firearm) they would like be shot or at least tasered. This is all about making guns completely foreign to the great masses! In years past kids played with cap guns and water pistols. Many graduated to shooting .22’s, often earning their hunter safety certification (which often included live firing) right in their public schools. Others took part in NRA marksmanship events. Kids were taught to respect and understand firearms in the past. Today kids are taught to fear and loathe firearms. That is terribly wrong.